You will be given a reference e-book to read which has 339 pages And the test will be based on that e-book , you can take final test within 1 year of purchase. Service management is also popular for its other name IT service management (ITSM). It refers to the integration of the actual sales and customer intersection into the supply chain management. One of the major purposes of proper service management is to effectively optimize supply chains that are usually more service intensive and complex when compared to the usual supply chain which has finished goods. The majority of supply chains that are service incentive usually need huge inventories and an even tighter incorporation with third parties and the field service. These supply chains are also required to effectively accommodate uncertain and inconsistent demands through the establishment of more advanced product flows and information. All the processes used in the supply chains that are service intensive should also be properly coordinated along multiple service locations that contain numerous parts and levels. If you wish to become a certified service manager, then rest assured that there is a reliable service management course which can work perfectly for you. Enrolling in this certification course will allow you to become more familiar about all the benefits that the service management process and practices can provide including the significant decrease in the cost of services, reduction of the total cost of inventory for service parts, proper optimization of the quality of customer care, increase revenue, improve the level of customer satisfaction, reduce the amount of service part obsolescence and reduce the number of visits to technicians. If one of your biggest dreams is to become an expert in service management, then rest assured that the service management certification program which is now offered by a popular and reputable online certification company called Brainmeasures can assist you in achieving your goals. This certification course can offer you the most detailed training considering the fact that it uses high quality learning materials while also providing a hundred percent assurance that the program was developed by experts in the field of service management who knows exactly what they are doing. The program also operates by sticking to all the standards and regulations set by ISO so getting an idea about how to successfully carry out your tasks as a certified service manager is greatly possible. With the help of this program, you will also become more familiar about all the major components of the service management process including the service offerings and strategies, spare parts management, the returns, warranties and repairs, the field service management and the customer management. Brainmeasures will give you your certificate as soon as you pass its expertly developed and error-free service management exam. 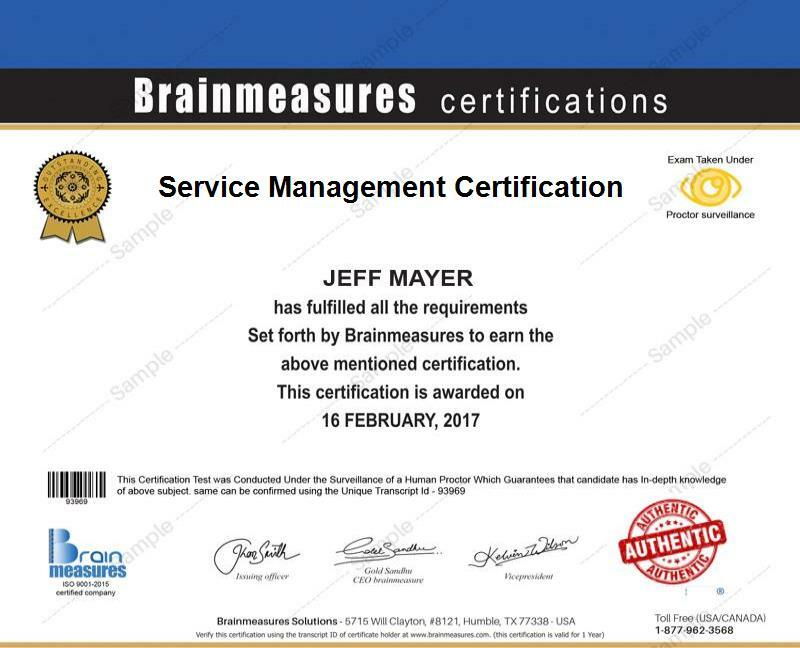 You can expect the service management certification program offered by Brainmeasures to help those who are in need of relevant information about the service management process. The certification course is suitable enough for those who need a basic understanding about service management, professionals who are responsible in using the process to improve the quality of the IT department of an organization, IT professionals who adapts the ITIL and COBIT framework when performing their tasks and responsibilities and for anyone who is greatly interested about completely understanding the subject. Getting any service management position in an organization can be very profitable for you. It is because it allows you to earn a decent sum of money. Service management certification holders who are still new in the field can earn around $40,000 annually while the more experienced ones can enjoy an annual salary which starts from $104,000.